Sad but true - the gardening season is essentially finished. I've rearranged things and the eggplants live on, but the main part of the harvest is complete. With only 9 plants, 2017 was a relatively small effort, but perfectly adequate for our needs. My 2017 eggplant garden represented two mini-projects...further refining three named selections from dehybridization of Orient Express, and refinement of a unique green/purple variety which I named Mardi Gras. I grew two plants of Midnight Lightning (in which there is still a bit of variation), two of Skinny Twilight, and one Twilight Lightning. Below, you can see the black purple hue of Midnight Lightning (foliage heavily blushed with purple, fruit with black calyx), the dark purple Skinny Twilight (foliage green with no purplish blush, calyx with some green), and Twilight Lightning (fruit white with pale purple blush, green calyx, plant is more compact). All yield heavily. As far as the Mardi Gras project, the origin was an accidental cross of the white variety Casper. 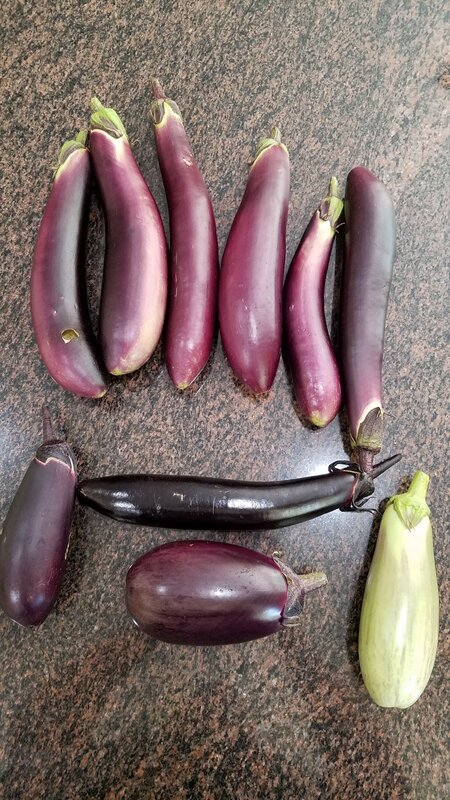 One plant gave dark purple fruit - but saved seed provided all sorts of colors, the most interesting of which was a pale green teardrop shaped eggplant with distinct purple streaks. I grew two of the Mardi Gras selections (they grew identically - seedling stem color green), and two plants with purple stems which gave attractive black purple fruit. All in all, I accomplished the objectives...good leads for all three of the Orient Express offspring, and nice examples of Mardi Gras. I've got plenty of seed saved and would be happy to share small samples with those who want to give any of them a try - just shoot me an email. Older Post...what a pleasure it is to blog from the back deck on a beautiful late August day.